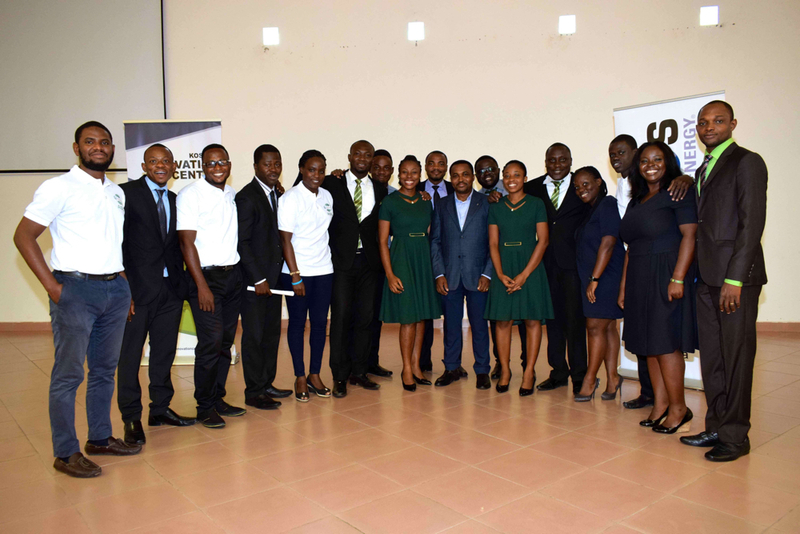 Over the last two years, KIC’s AgriTech Challenge has identified, nurtured, and funded some of the most promising youth-driven agritech startups in Ghana. Each year’s cohort receives extensive training and funded research tours as they build their business concepts, and ultimately, two out of the dozen-ish teams receive $50,000 worth of seed funding after a series of ‘pitch’ rounds. Winners then go into a year-long incubation program at the Meltwater Entrepreneurial School of Technology (MEST). But the 2017 KIC cohort defied all expectations—not only did we find two winners, but all six of the teams that made it to the final pitch round managed to create some kind of exit strategy to keep their business concepts alive. Here’s a quick rundown of each team’s business concepts and how they fared in the AgriTech Challenge. KIC AgriTech Challenge entrepreneurs at the final pitch session in July. Image courtesy KIC. QualiTrace: We met QualiTrace in our ‘Women in AgriTech’ piece a couple of months ago, and they ended the AgriTech Challenge as one of two winners that received KIC seed funding. QualiTrace has built a traceability and verification system for agricultural herbicide and pesticide suppliers, their target customers. Farmers who purchase these products then use a simple mobile interface (SMS or USSD) to verify the authenticity of chemicals. AgroInnova: AgroInnova has built Akokotakra, an enterprise resources management software for Ghanaian poultry farmers. Akokotakra (which means “feathers”) helps poultry farmers manage and streamline everything from egg sorting to feed and health management. AgroInnova will join Qualitrace in MEST’s year-long incubator as the second KIC-funded startup of the 2017 cohort. AniTrack: Unlike other teams in the 2017 cohort, AniTrack is composed solely of Entrepreneurs in Training (EITs) in MEST’s year-long graduate-level course in software development, business and communications. AniTrack tags farm animals with RFID units on their ears, and in combination with on-site sensors, helps cattle and goat owners track the health and movement of their herds. While they were just barely edged out of KIC funding by QualiTrace and AgroInnova, AniTrack’s pitch was picked up by MEST itself, which provided them with $50,000 of seed funding and a spot in the 2018 MEST Incubation cohort. Complete Farmer: Complete Farmer has built an online resource and training tool aimed at urban professionals and retirees who want to enter the agricultural sector as a source of supplementary income. Complete Farmer’s final pitch was so compelling to one of the guest attendees, Premium Bank of Ghana, that the bank decided to foot the bill for the team’s seed funding of $50,000. As a result, they too will be part of the 2018 MEST Incubation cohort. Rent-a-Farm: Like Complete Farmer, Rent-a-Farm also focuses on urban professionals. Specifically, it scouts out and rents litigation-free agricultural lands in Ghana—no small feat in a place where land tenure issues are extremely common. Though the Rent-a-Farm team did not receive direct funding as a result of the final pitch, they are now merging with the Complete Farmer team to continue to build out this offering. AgroSeal: AgroSeal built a business plan to reduce post-harvest losses by connecting fruit and vegetable farmers with truck drivers and packaging services via mobile. While this concept did not receive any KIC funding, it did draw the attention of another local company AgroCenta, which ultimately partnered with AgroSeal as a complement to its online service that connects smallholder farmers with new markets. AgroCenta itself has something of a Cinderella tale—it was part of KIC’s 2016 cohort, but it failed to even make it into the final pitch round. Undeterred by the setback, AgroCenta went on to find another external funder to build what has become a 40-person company that serves more than 8,000 farmers across six regions in Ghana. In sum, the KIC AgriTech Challenge has far surpassed our goals. We expected no more than four companies to emerge from the last two years of the program. Instead, KIC has helped catalyze seven fully funded businesses that are joining the growing number of tech-driven agricultural startups in Ghana. [email protected] will be tracking their progress over the next year, as well as providing updates on KIC’s upcoming 2018 cohort. Stay tuned!